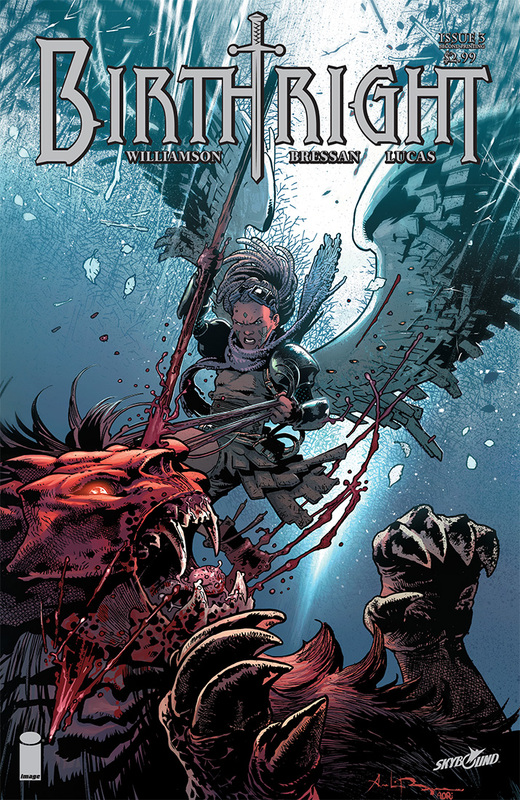 Joshua Williamson, Andrei Bressan and Adriano Lucas have a hit on their hands for Skybound Entertainment with Birthright. The book has all sorts of plot twists amidst an epic fantasy ride. Well, that ride is getting better, as Birthright #3 is being fast-tracked to a second printing in order to meet customer demand. In Birthright #3—after a standoff in the police station—the Rhodes family is on the run from the law, and for their lives. And just what horrors did Mikey survive while he was away? Birthright #3 remains available for purchase across all digital platforms, including the Image Comics website, the official Image Comics iOS app, Comixology’s website, iOS, Android and Google Play. Birthright #3 second printing arrives in stores on January 28 and can be pre-ordered with Diamond Code NOV148198. Birthright #4 hits stores January 7 and can be ordered with Diamond Code NOV140642.